After four days of weather watch advisories we have upgraded to a precautionary weather warning for the potential for strong winds and very heavy rainfalls. There remains alot of uncertainty in Big Bertha’s tracking with the last 3 model runs bringing the central depression towards Ireland which could lead to 80mm+ of rainfall and winds of 75kmh + to southern counties of Munster and Leinster. Depending on sea swells and high spring tides the current risk of coastal flooding is slight but that could change as the central pressure of the system may well drop significantly on approach to the British & Irish Isles leading to stronger wind speeds. The biggest threat at the moment if the northerly track is confirmed by Sunday morning is the rainfall accumulations which will lead to widespread flooding in Munster and Leinster. 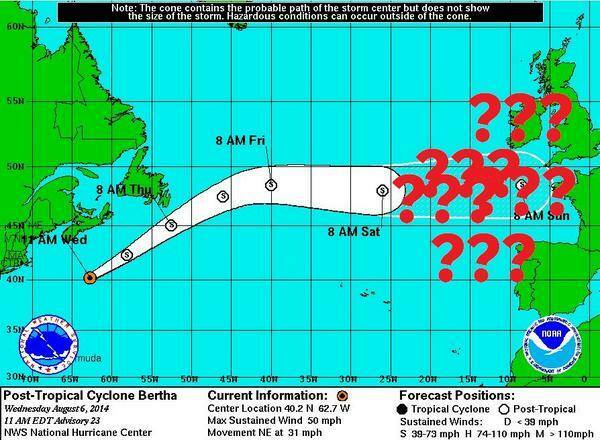 The good news is that if Bertha tracks south of Ireland the precautionary warning will be cancelled.